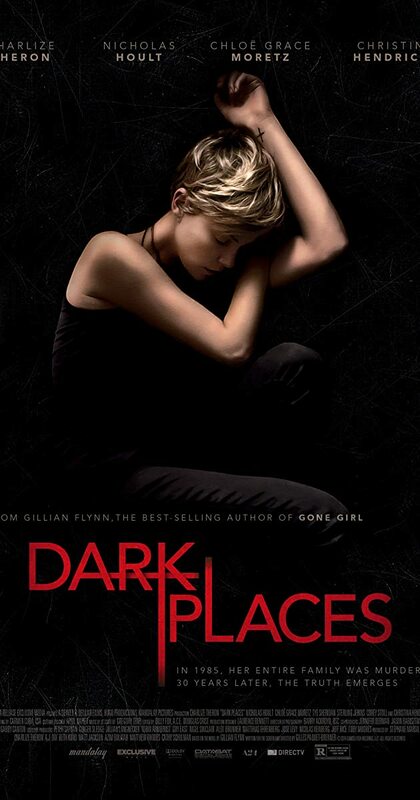 You can’t blame the producers and studio behind Dark Places for hoping it would be a sleeper hit. Based on a novel by the writer of Gone Girl, starring an accomplished actress in the lead role, centered around a drip-fed mystery with an ever so slight twist to finish off the whole tale. Unfortunately, as much as those elements do come into play, it doesn’t hold the same success as the David Fincher movie. This isn’t for want of trying. There is a great central story surrounding a young girl who is the only survivor after her family is massacred, seemingly by her brother who is subsequently jailed for the crime. Years later, once she has grown up into Charlize Theron, she is asked to review the evidence because it seems her brother may not have been the killer after all. So far, so gripping, except there is something really pedestrian about the way the tale is told. It doesn’t have any striking aesthetic. It isn’t shot in a way to spark imagination or elevate the scenes. It feels very much like a movie by the numbers. The story unfolds and the audience is left as a passive viewer to the experience. This goes for the performances too. There is nothing particularly wrong with the performances but they don’t really ask much of those involved. Charlize Theron has been known to elevate movies, adding quality to Oscar winning Monster and recent action sequel Mad Max: Fury Road. Here she looks almost bored and again, going through the motions. There are other notable performances, those of Nicholas Hoult, Tye Sheridan and Chloe Grace Moretz particularly but they seem to be making the best of quite a drab script. It is a shame because the central mystery does have some potential but with this uninspired presentation, when the revelations do begin to surface, you struggle to care and struggle even less to feel shocked or invested. It all hangs on a slightly strange revelation anyway. Movies can be hinged on large, sometimes flimsy twists but you are willing to overlook it because it makes the story better. Here the twist and revelation is played out and you wait for the conclusion rather than feel gripped to the edge of the seat waiting for it to play out. Overall, Dark Places holds all the ingredients for a good movie but they aren’t combined into anything inspiring or hugely entertaining. It is a film which goes through the motions, holding uninspired performances from great actors and actresses like Charlize Theron. It may be by the writer behind Gone Girl but you won’t find the same quality here.